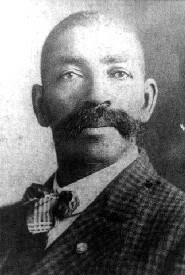 Bass Reeves was born into slavery in the summer of 1838 in Crawford County, Arkansas. Like most slaves, he was given the surname of his owners, the Reeves family. During the Civil War, Reeves fled north to what is now Oklahoma, and lived with the Cherokee, Seminole, and Creek Indians, learning their languages, until he was freed in 1865 by the Thirteenth Amendment which abolished slavery. Reeves and his family farmed until 1875, when a couple of fortuitous appointments changed his fate. Isaac Parker was picked as federal judge for the Indian Territory, and he named James F. Fagan as U.S. marshal, directing him to hire 200 deputy U.S. marshals. Fagan had heard about Reeves, who knew the Indian Territory and could speak several Indian languages. He recruited him as a deputy; Reeves was the first black deputy to serve west of the Mississippi River. Reeves was initially assigned to be a deputy U.S. marshal for the Western District of Arkansas, which had responsibility also for the Indian Territory. He served there until 1893. Then he was transferred to the Eastern District of Texas in Paris, Texas, for a short while. In 1897, he was transferred again, serving at the Muskogee Federal Court back in Indian Territory. Reeves worked for thirty-two years as a deputy, and was reputed to be one of the bravest of any deputies. During his long career, he was credited with arresting more than 3,000 felons. He shot and killed 14 outlaws in self-defense. He was never even wounded, despite having his hat and belt shot off on separate occasions. Reeves overcame the worst sort of adversity with his exceptional mind and extraordinary gumption. For example, as a slave, Bass was never allowed to learn to read, but when he became a deputy, he managed to capture outlaws by his ingenuity and courage. He would have arrest warrants read to him by someone else, and in the process he would memorize the shapes of the letters for each name, along with the charges against that person. Then he’d go out hunting for outlaws. He not only arrested the criminals (he once brought in seventeen prisoners at once!) but at night, he’d talk to them about the Bible and about repentance. And his integrity was unquestioned as well. He even arrested his own son for murder, after none of his colleagues would do it out of respect for Bass. When Oklahoma became a state in 1907, Bass Reeves, then 68, became an officer of the Muskogee Police Department. He served for two years before he became ill and had to retire. He died at age 72 in 1910 of a kidney disease. Hundreds of people – blacks, whites, and Indians, attended his funeral.